Those who use Windows Seven surely know that its features are very great. And the combination of different settings that were not previously found in XP. However, those who have used XP earlier and new users in Seven have trouble with some minor settings. Here are some of the default settings that need to be changed many times. I will discuss some such settings today. 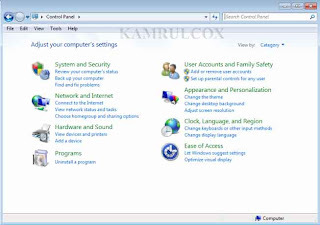 Windows Seven Control Panel is very rich. By default, the options are in categories / groups. It is a problem to find all the options. If we want we can show all the icons. For this, go to the Control Panel from the Start menu. Select "Vew by to Large Icon" in the top right corner. From now on you will see all the options. XP has two types of start-up menus, but Seven has one. It has been made beautiful earlier than ever. And there are several options to sort your choice from XP to Modern. For this, right-click on the taskbar and go to Properties> Start Menu and go to Power Button action. 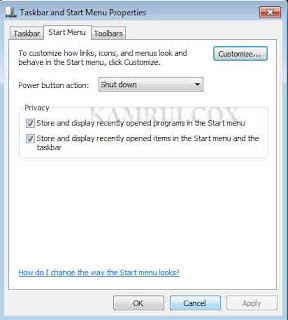 In Shaveen click on the Start Menu, the Shut down option on the Shut down button is the default option. You can change this option from Power Button action. Below are privacy options. (1) Store and Display recently opened prgrams in the Start menu. (2) Store and Display recently opened items in the Start menu and taskbar. 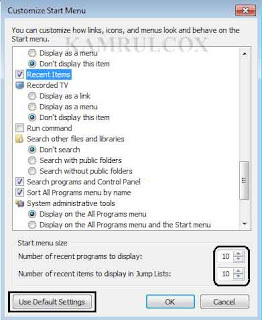 If you have these options, then you can see recently used programs in the Start menu and at Recent Items. Some menus are not enabled by default in Seven. Such as Recent Items For this, go to Customize and give the check mark as you need and pick a check mark from what you do not want to see in the Start menu. I gave a tick mark to the Recent Items. You can also give the number of recent items you want to see in the Start menu. You can set default settings by using Default Default Settings. Finally, OK days. The Seven Taskbar is usually just like XP. But you can keep it right-handed, up-down. Drugs had to be done in XP. You can do this by clicking here. 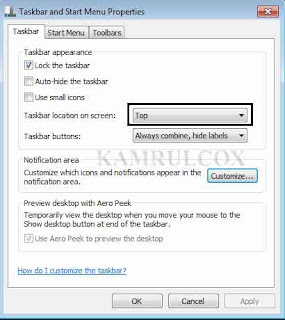 To do this, right-click on the taskbar and go to Properties> Taskbar and select a day from the Taskbar Location On Screen. Apply I gave the top. Seven Taskbayers usually have IE, WMP, My Computer Explorer programs pinned. Pin means that the program will always go from there to the place you pin it. Even if you close the program, it will remain there. The advantage of this is that you do not have to go far enough to run if you keep pins on programs that you use always. The program will run once you click once to pin the taskbar. To pin the program, right-click on any program in the open and click on Pin this program to Taskbar. Then it will be pinched on the taskbar immediately. 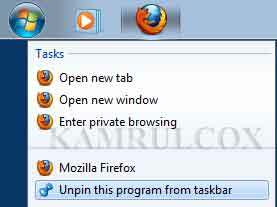 To unpin the program, right click on the Pin program and click Unpin this program from Taskbar. Then it will become unpin immediately. If you want to drag the pinned programs to the back, you can also apply the following. The Notification Area Icon means the icons in the right-hand corner of the taskbar. These icons take the position of the taskbar as soon as Windows runs. Notification Area Icon is hidden in Windows Seven except for a few. We can un-hide them if we want. 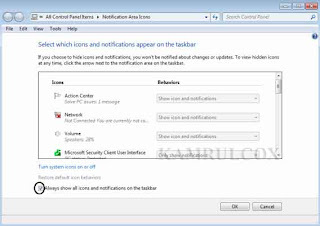 For this, click on the small arrow icon and click on Customize or open Notification Area Icon from the Control Panel. At the bottom of the window that opens, give the check mark with the check mark on the taskbar. 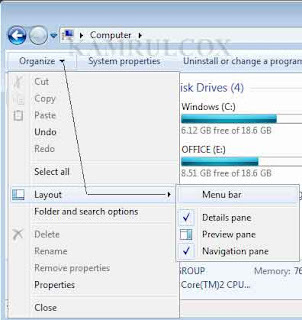 If you want to uninstall the Cono program in XP, then select the program and right-click on it's right side option. But Seven has brought a variation in this option. So XP users have little trouble to uninstall the program. 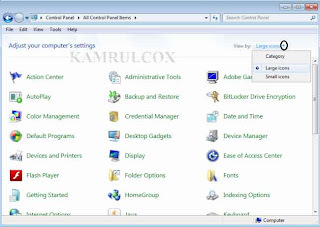 If you want to uninstall a program in Seven, from Control Panel, click Programs and Features. 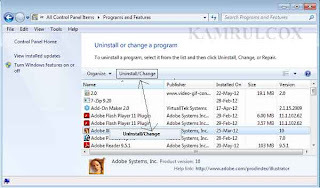 Right-click on the program that you want to uninstall, then get the Uninstall option. 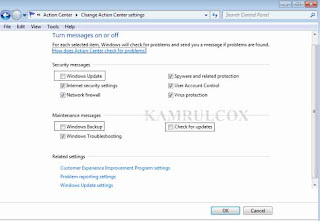 There are options that are available with Change / Repair in the program that are not uninstalled. Besides, there are options on the above selected areas. Which can be needed. 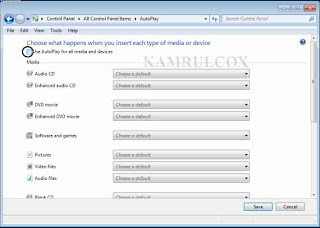 The autoplay menu usually refers to the menu that comes with CD, USB or similar media. With this option in XP due to any media entry, the program runs through autorun.inf file (although it has options to close). The virus in the USB was harmful. The option of autoplay in Seven has been kept as usual, but does not play automatically, like XP. The problem in the virus has been fairly far away. Yet many people want to disable the autoplay option. Go to Control Panel from AutoPlay. Save yourself by ticking the check box for Use autoplay for all media and devices. If you want to go back to the previous state, tick mark again. Desktop icons have large, medium, small viewing options in Seven. For this, right-click on the desktop and view View from Medium. If you do not like, you can do big or small and try. It allows you to view desktop icons in different ways. If you do not want to see an icon on the desktop, then tick the box for Show desktop icons. The desktop icon will not be visible in it. If you want to see the tick mark again. On the desktop you can also bring the icons of My Computer, Recyclebin, User's File, Network, Control Panel, and even if you prefer not to miss it. For this, right click on the desktop and click on Personalize. The window below will appear. From there, click Change the desktop icons. Now under the picture below the Desktop Icons which you need to tick mark with Apply> OK days. 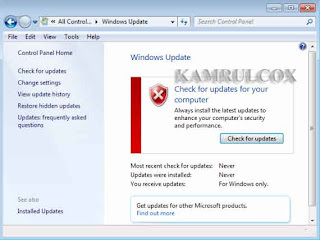 If your Windows is not genuine then the update option will be turned off. 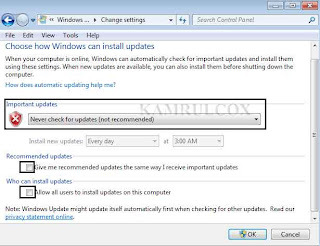 As soon as the Internet connection is started, Windows will start updating itself and your Windows will be disabled for many options. It is enabled in default settings. You can disabling it. For this, click on Windows Update at the very end of the Control Panel. Come on like below. Click Change Settings. Apply settings like the image below. Opening My Computer, XP, Edit, View, Tools at the top of XP, it is not the default setting. But if you want, it can be brought. For Open My Computer Just go to Organize> Layout at the top left corner of the image below and mark the Menu bar. From now on, when you open My Computer, you can always see the Menu bar. 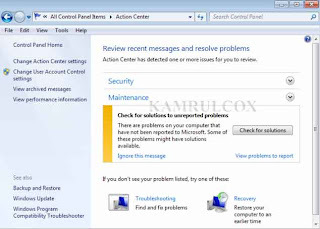 To access Action Center, right-click on the Action Center icon from the Notification Area icon and click Open Action Center. Then the Action Center will open. There are several options there. Pick up the check mark at no later than required. Like I've kept three options disabled. Update and Back Up Backup is much like the System Restore Option of XP.